It's safe to say that Mastodon's current tour with Eagles of Death Metal and Russian Circles will be one that they don't forget for a long time after vocalist/guitarist Brent Hinds proposed to his girlfriend on stage. Check out all the videos and pictures below! The proposal happened during Mastodon's show in Birmingham, AL on April 28, and of course, since it was on stage, plenty of fans got tons of video and photos for us to enjoy. Check them out below! Me and @raisamrn got engaged two nights ago! This lady is made of pure �� LOVE ❤️ ! Reddit user kylemat82 also snapped an amazing pic for us to enjoy. Check it out! It gets even better as Hinds' grandmother was in attendance for the show and proposal, and she makes it very clear that she rocks harder than your grandma. 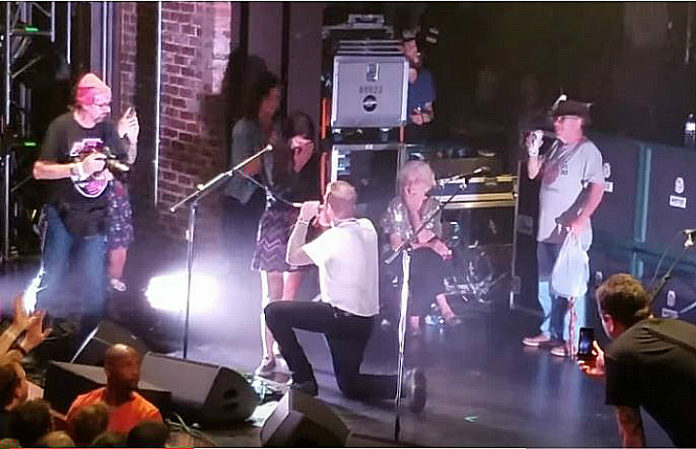 This is just more and more proof that the best proposals happen at concerts. Check out when Mastodon will be hitting your town below!